Your resources (employees, contractors, or partners) charge their time to projects. It is up to you if you direct them to only charge time against billable projects, or if you want to set up overhead projects or budgets and capture all of their time. Only time that is charged to a project can be billed, or counted against the metrics for that project.. ProFusion gives notifications about each project. The notifications will be sent to the leader. As with external contacts, the leader can be easily emailed about the project as well. Each approver gets email notifications that a project is waiting for them at the time of the transition, and those projects appear on their Dashboard screen also. 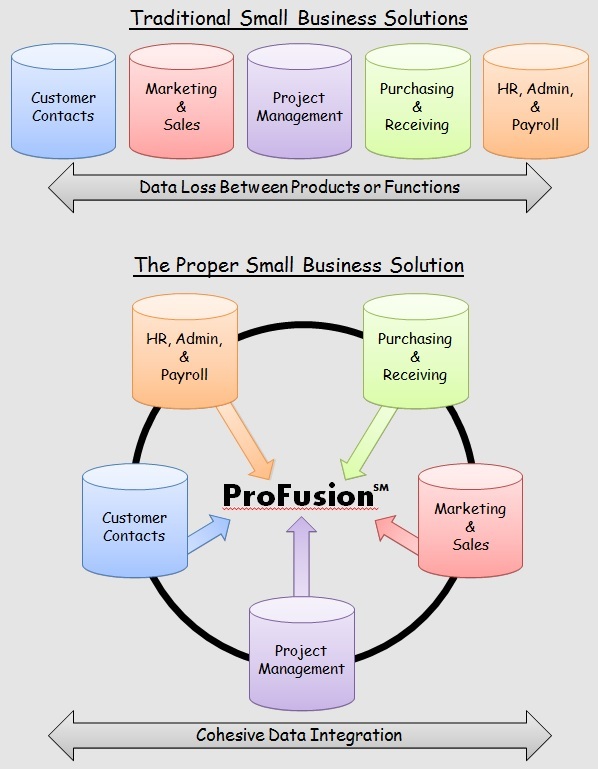 ProFusion collects a lot of data during its normal operation, and that information is useful in many ways. ProFusion keeps a record of all the data added to it. The action items/ tasks which are not a part of any project are also stored here. The data stored is also easy to track. ProFusion can create different types of reports such as internal reports for the company, specific project reports. It can also create individual and team performance reports. These reports can be viewed and exported in PDF and XLS formats. Each billing type has its own invoice, and each is customized with your company's logos and standard instructional statements, and can optionally include additional fees for payment via credit card. Authorized users can view reports on invoice status including invoice balance and days overdue. Projects plans are made of anticipated time, expense, and material purchases. Planned material costs can take the form of an allocation of funds, or include a specific quantity of a specific quoted material. Nowadays, Operational workloads are relocated to the cloud platforms. This helps in minimizing the hardware, maintenance, and software update requirements. The IT team can be used for more important contributions to the enterprise.